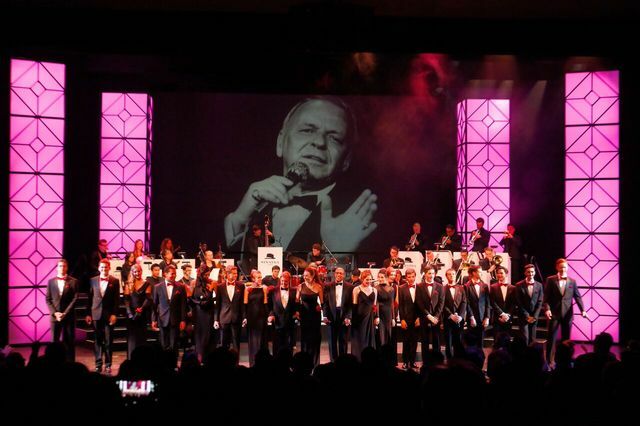 Talented students from the UCLA School of Theater, Film and Television's Department of Theater celebrate the 100th anniversary of Frank Sinatra's birth this weekend at the Ralph Freud Playhouse with a musical extravaganza conceived and directed by film, television and Broadway star Lainie Kazan. 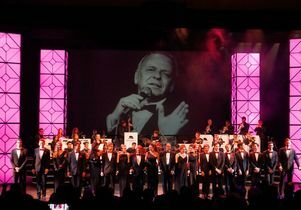 It's a spirited showcase of Sinatra classics, featuring the undergraduate performers of the Ray Bolger Musical Theater Program and the UCLA Jazz Orchestra, directed by Charley Harrison and performed before a giant backdrop of photos of Ol' Blue Eyes. At Thursday's opening-night performance, which ended with a standing ovation, Kazan shared some of her memories of Ol' Blue Eyes, her mentor. 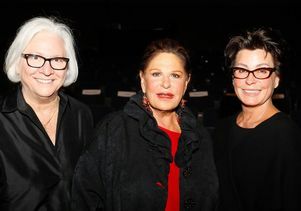 Also attending the opening-night festivities was Tina Sinatra, his daughter, representing the Sinatra family. The show runs through Sunday, Nov. 22. For more information, go here. Opening night of "Lainie's Cabaret"